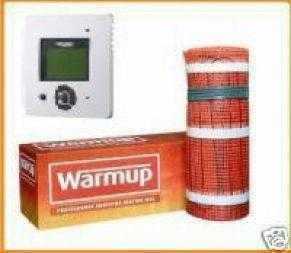 from £120.00 Warmup Underfloor Heating From tradebathrooms.com at guaranteed lowest prices on the net. Step into a warm bathroom everyday with under floor heating systems that keep it cosier when you need it most. Wave goodbye to chilly mornings and bitter-cold bathing with electric underfloor heating systems to suit your needs. Whether you are looking for your flooring to be your primary heat source or underfloor heating to take the chill off; we can offer a suitable under floor heating solution for you. Make the most of your bathroom buy installing under floor heating that maintains a comfortable temperature using a thermostat. Choose an underfloor heating solution that doesn’t require digging up your floor or adding messy concrete to the mix. Whether you do not have the room for a radiator or simply want an attractive solution to your heating requirements; you can find electric underfloor heating systems to suit your needs at Trade Bathrooms. Find under floor heating to make your bathing experience even more comfortable from Trade Bathrooms. Whether you are looking to keep things drier in your bathroom or add a little more comfort; we offer electric underfloor heating systems to suit your needs. To find out more about our underfloor heating, read about it online today.